Welcome to Sunsational Stamps Design Team Blog Hop for August 2017. Thank you for joining us today! 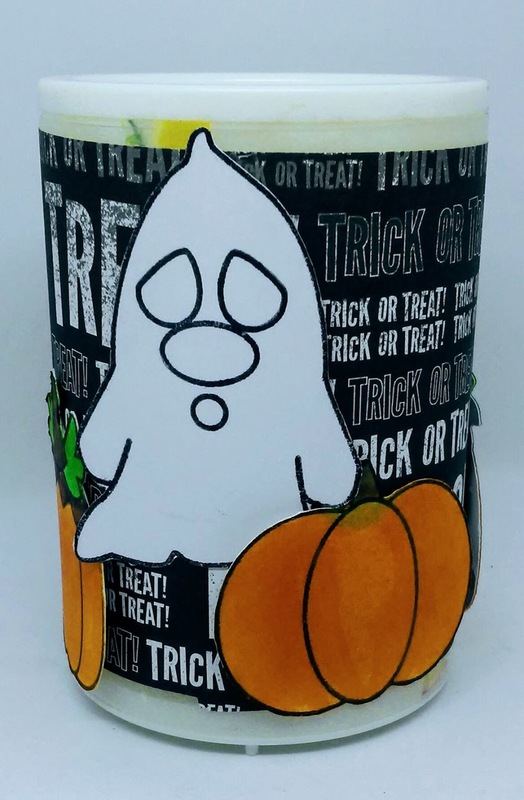 We will be showcasing one set this month for Halloween this 4x6 clear set "Trick or Treat" has 12 images including pumpkins, a ghost, bat, faces and 2 sentiments. They are too cute for words and you will be inspired by our amazing Design Team's projects. . I created this light up candle that I purchased at Dollar Tree. Using our fun Halloween set I stamped two each of the pumpkins and the ghosts and cut them with my Scan n Cut. I used blending tools and ranger dye inks to color the images and the background paper is from a Halloween stack in my stash purchased from Oriental Trading a couple years ago. This short video is the candle in action. Very cute candle--love your little video too! Adorable, I love this idea, you are so clever!